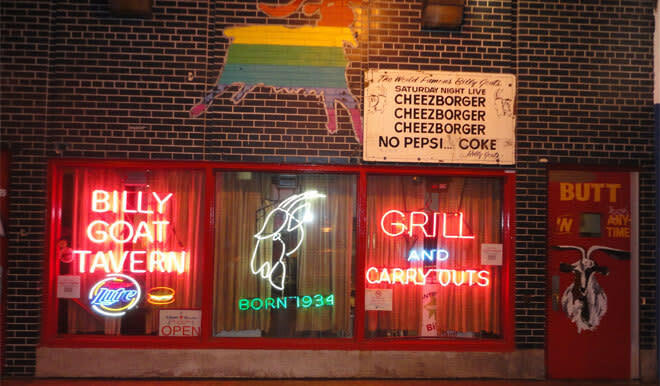 The original Billy Goat Tavern location was "born" in 1934 when Greek immigrant, William "Billy Goat" Sianis, purchased the Lincoln Tavern. Billy Goat bought the tavern for $205, with a check that bounced but was later repaid with sales from the first weekend. The tavern was located across from the Chicago Stadium (now United Center) and attracted mainly sports fans. Sianis became known as "Billy Goat," when a goat fell off a passing truck and wandered inside. Sianis adopted the goat, grew a goatee, acquired the nickname "Billy Goat," and changed the name of the bar to the Billy Goat Tavern. In 1964, Billy Goat moved his tavern to its present subterranean location.